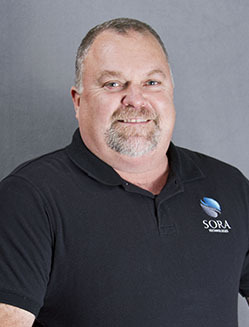 Meet the people who make Sora work. Jerad sets himself apart with his ability to communicate with novice IT users and seasoned IT professionals alike. Jerad does not overwhelm novice users with tech jargon. Instead, he makes the technical side of IT accessible and understandable to all level of users. He excels at understanding a customer’s needs, providing solutions that fit, and explaining complex systems in simple terms. Jerad has a broad background in IT and a sincere passion for customer service. 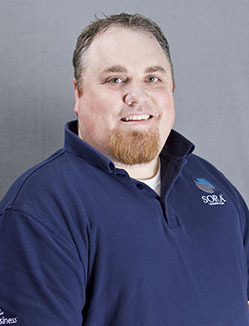 While he brings extensive technical knowledge to his position at Sora, Jerad truly understands the personal side of the IT world and the needs of the individual user. 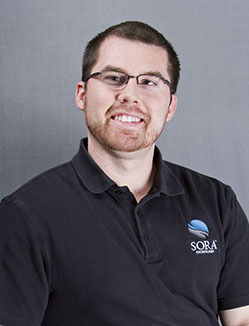 It is Jerad’s focus on the personal satisfaction of each customer that makes him a true asset to his clients and the Sora team. Russell Adams was always told he could accomplish anything he put his mind and effort into. When he bought his first business (a moving company from his father-in-law), it was nothing more than one truck and a few employees. Through his unwavering dedication (and some long hours), that business has grown into one of the largest agents for Arpin Van Lines in the country, and he has a complementary mini-storage facility that is very successful too. But that isn’t all. Russell’s philosophy of creating customers for life and never settling for second place has allowed him to grow these and other businesses in the Peoria area. This includes a Canon copier dealership, June restaurant (which was the first farm-to-table restaurant in Peoria’s history), and Sora Technologies in 2009. Jacob Adams is a Computer Scientist and Business Technology Advisor with more than 20 years of IT experience. Jacob has been formally trained by Microsoft, Apple, Cisco, Comptia, Vmware, Tenable, Bomgar, eCopy and Cannon. He knows how to properly handle secure data and is trained in PCI and HIPAA compliance. He currently serves as the SOX control owner for a Fortune 500 company — developing their processes, SOPs and narratives. Jacob stays heavily involved in the IT industry and his community. He has served on the Microsoft Intune Advisory Board, the ICC Scholarship Selection Committee, and the CIS Advisory Board for Midstate College. He is one of the co-founders for the startup app Filterly, which scans and delivers information that matches your interests right to your screen. Listen to Jacob tell you how Filterly works at TechCrunch Disrupt. Managed IT solutions done right. We do what is right. Not what is easy. We are defined by our values.